In Nigeria, a state (Hausa: jiha, Igbo: ȯra, Yoruba: ìpínlẹ̀) is a federated political entity that shares sovereignty with the federal government. There are 36 states bound together by a federal agreement. The Federal Capital Territory is not a state and under the direct control of the federal government. The states are further divided into a total of 774 Local Government Areas. Under the Nigerian Constitution, states have the power to ratify constitutional amendments. The Nigerian traditional states predate all the modern states but have no legal or administrative powers. 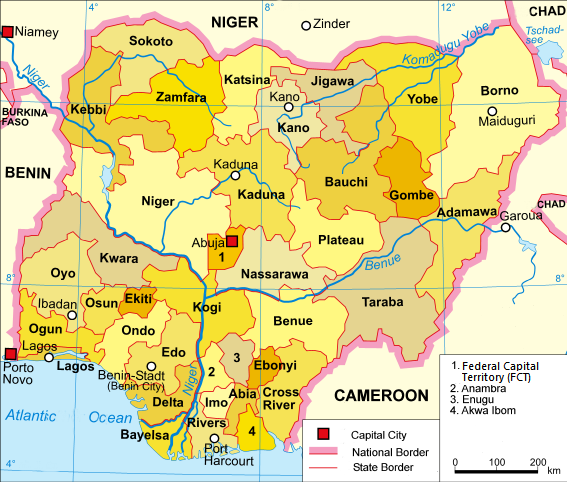 1960-1963 At the time of independence in 1960, Nigeria was a Federal State of three Regions: Northern, Western, and Eastern. Additionally, provinces, which were a legacy of colonial times, remained extant until they were abolished in 1976. 1963-1967 In 1963, two provinces were detached from the Western Region to form the new Mid-Western Region. 1967-1976 In 1967, the regions were replaced by 12 states due to a military decree; only the former Mid-Western Region escaped division, and formed a single state following the restructuring. From 1967 to 1970 the Eastern Region attempted to secede, as a nation called Biafra during the Nigerian civil war. 1976-1987 In 1976, seven new states were created, making 19 altogether. 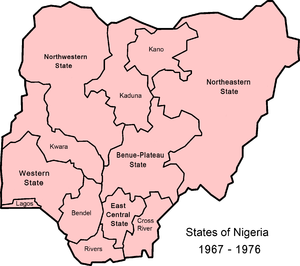 1987-1991 During this period, there were 21 states and later, Abuja, the Federal Capital Territory. 1991-1996 During this period, there were 30 states and the Federal Capital Territory. The Federal Capital Territory was established in 1991. In 1987 two new states were established, followed by another nine in 1991, bringing the total to 30. The latest change, in 1996, resulted in the present number of 36 states. As sovereign entities, States of Nigeria have the right to organize/structure their individual governments in any way within the parameters set by the Constitution of Nigeria. At the State level, the legislature is unicameral, with the number of its members equal to three times the number of legislatures it has in the Federal House of Representatives. It has the power to legislate on matters on the concurrent list. At the State level, the Head of the executive is called the Governor, who has the power to appoint people to the State Executive Council, subject to the advice and consent of the State House of Assembly (Legislature). The Head of a ministry at the State level is called a commissioner, who is assisted by a permanent secretary, who is also a senior civil servant of the State. The Judiciary is one of the co-equal arms of the State government concerned with the interpretation of the laws of the State government. The Judiciary is headed by the Chief Justice of the State appointed by the governor subject to the approval of the State House of Assembly. Gboyega Ajayi (2007). The military and the Nigerian state, 1966-1993: a study of the strategies of political power control. Trenton, New Jersey: Africa World Press. ISBN 1-59221-568-8. Solomon Akhere Benjamin (1999). The 1996 state and local government reorganizations in Nigeria. Ibadan: Nigerian Institute of Social and Economic Research. ISBN 978-181-238-9. Rotimi T. Suberu (1994). 1991 state and local government reorganizations in Nigeria. Ibadan: Institute of African Studies, University of Ibadan. ISBN 978-2015-28-8. “New States of Nigeria”. Statoids. States And Capital In Nigeria, Their Slogans & Current Governors A comprehensive list of all states in Nigeria and their current governors.